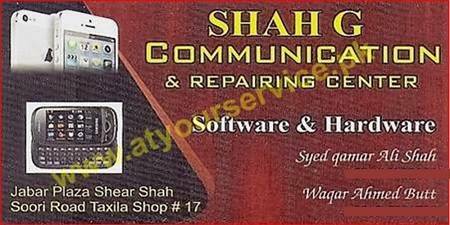 Shah G Communication & Repairing Centre is located in Jabir Plaza, Sher Shah Suri Road, Taxila. We deal in all kind of mobiles and accessories. We repairs mobiles and other electronic devices. Mobile software updates or renewal service is available. Best repair facility for mobiles and other electronics devices in Taxila and Wah region. Very honest and competent.